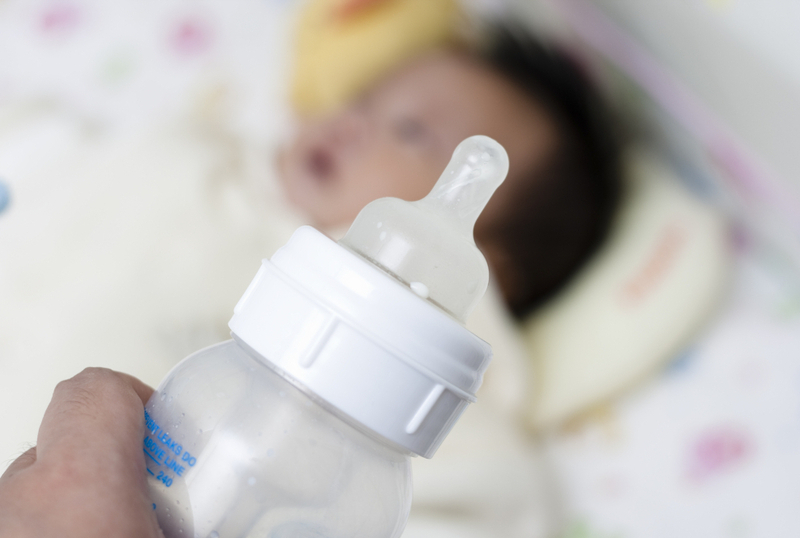 How Risky Is Infant Formula Made With Tokyo Tap Water? : Shots - Health News The warning that Tokyo's tap water contains twice as much radioactive iodine as allowed for infants strikes a particularly distressing chord. And the shortage of bottled water there compounds the anxiety for mothers of formula-fed babies. An expert on radiation offers some practical advice. Another reassuring fact: The reported radiation dose in Tokyo tap water (210 becquerels) versus the Japanese safety limits (100 becquerels/liter for infants, 300 for adults) is not far from the difference in radiation dose people naturally get if they live in a place like Denver versus a sea-level city such as Los Angeles. That's because the thinner atmosphere in Denver provides less protection against cosmic rays. The warning that Tokyo's tap water contains twice as much radioactive iodine as allowed for infants strikes a particularly distressing chord. Infants are especially vulnerable because their cells are dividing faster than at any other time of life, and dividing cells are especially sensitive to radiation damage. But Kim Kearfott, an expert on the health effects of radiation, says these young mothers shouldn't panic. "If it were my infant, I would make an effort to secure some water that's clean," says Kearfott, a professor of nuclear engineering and radiological sciences at the University of Michigan. But if she couldn't, she says, "I wouldn't be concerned [about using the tap water] unless this continues over a long time period." How long? "Half a year," she says. That's because the radiation dose limit for infants — 100 becquerels per liter of water — is based on a year's worth of exposure. The radioactivity from iodine-131 in Tokyo's water, due to the emissions of the Fukushima Dai-ichi power plant, is twice that. So drinking the radioactive tap water for half a year would not exceed the safety standard, she says. But parents are understandably reluctant to ignore the authorities' advice to stop giving the contaminated water to their babies. Kearfott says there are other ways to reduce the risk. "Using a charcoal filter would dramatically reduce the amount of iodine-131 in the water, by between 50 and 100 percent," she says. These are the kinds of filters available in many grocery stores. Another strategy is to draw tap water and keep it in a jug for eight days. That's the half-life of iodine-131, so in that time, half of the radioactivity would be gone — and the water would be within the 100-becquerel safety standard. Meanwhile, parents could use bottled water if available, or just use tap water in the knowledge that short-term use isn't likely to cause any harm. "We would guess that cancer rates would be higher for people living in the Rockies," Kearfott says. "However, we've been unable to detect any increase. There are too many confounding factors, and the risks are much, much too small." Another thing people should keep in mind is that the cancer risk from very low levels of radiation exposure are really unknown. Our knowledge of that risk is based largely on 60 years of studies of cancer among survivors of the atomic bombs at Hiroshima and Nagasaki. From that research, the smallest radiation dose that scientists can tie to cancer risk is 100 millisieverts. Below that, the risk is just a guess — or rather, an extrapolation based on the somewhat controversial assumption that there's a straight-line relationship between radiation dose and cancer risk. The radiation dose in a liter of Tokyo tap water right now is equivalent to 1 to 2 millisieverts. That's a tiny fraction (1 to 2 percent) of the lowest cancer threshold that scientists have been able to identify, based largely on the research from Hiroshima and Nagasaki. Some health researchers are calling for monitoring to begin now for any possible longterm health effects from Fukushima. "We need to stay calm and reasonable," Kearfott says.